In the Ganapathi Upanishad, Ganesha is identified with the Supreme Self. The legends that are connected with Lord Ganesha are recorded in the Ganesha Khanda of the 'Brahma Vivartha Purana.' Here are two of those popular stories--"The Curse of the Moon" and "Who is Elder?" Lord Ganesha, who was the son of Lord Shiva and the goddess Parvati, loved sweets. One day when a disciple offered him sweets, Ganesha accepted the treats and spent the rest of the day hoarding them. That night, when it was time to go home, he carried all the sweets along, but when he tripped on a stone and stumbled, all the sweets scattered onto the ground. As he picked up the sweets in embarrassment, Lord Ganesha looked up and saw that the Moon God (Chandra Dev) was laughing at him. Angry, Lord Ganesha cursed the moon for laughing, and for being full of vanity and pride. The Moon quickly rushed to apologize, and when Lord Ganesha recognized the moon’s sincerity, he quickly extended forgiveness. But he dictated that from that day forward, the moon would no longer be full all the time, but would disappear and slowly reappear over 15 days time. Lord Ganesha also proclaimed that since the moon had made fun of him on Chaturthi, for thereafter, anyone who looked at the moon on that date would face troubles and false accusations. Satrajit, who secured a jewel syamantaka from Surya, would not part with it even when Krishna the Lord of Dwaraka, asked for it, insisting that it would be safe with him. Prasena, the brother of Satrajit, went out hunting wearing the jewel but was killed by a lion. Jambavan, of the Ramayana fame, killed the lion and gave it to his son to play with. When Prasena did not return, Satrajit falsely accused Krishna of killing Prasena for the sake of the jewel. Krishna, in order to remove the stain on his reputation, set out in search of the jewel and found it in Jambavan's cave, along with his child. Jambavan attacked Krishna, thinking him to be an intruder who had come to take away the jewel. They fought each other for 28 days, until Jambavan, his whole body terribly weakened from the hammering of Krishna's fists, finally recognized Him as Lord Rama. As a repentance for his having fought Krishna, Jambavan gave Krishna the jewel and also his daughter Jambavati in marriage. Krishna returned to Dvaraka with Jambavati and the jewel and returned it to Satrajit, who in turn repented for his false accusation. He promptly offered to give Krishna the jewel and his daughter Satyabhama in marriage. Krishna accepted Satyabhama as his wife but did not accept the jewel. Repeating or listening to this story is said to be a remedy to the bad luck suffered by anyone who looks at the moon on the night of Ganesh Charturthi. Ganesha and His brother Lord Subramanya (Kartikya) once had a dispute as to who was the elder of the two. 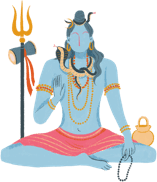 The matter was referred to Lord Shiva for a final decision. Shiva decided that whoever would make a tour of the whole world and come back first to the starting point had the right to be the elder. Subramanya flew off at once on his vehicle, the peacock, to make a circuit of the world. But the wise Ganesha went in loving worshipfulness around His divine parents and asked for the prize of His victory. Lord Shiva said, "Beloved and wise Ganesha! But how can I give you the prize; you did not go around the world?" Ganesha replied, "No, but I have gone around my parents. My parents represent the entire manifested universe!" Thus the dispute was settled in favor of Lord Ganesha, who was thereafter acknowledged as the elder of the two brothers. Mother Parvati also gave Him a fruit as a prize for this victory. What is the Story of the Birth of the Hindu God Krishna? 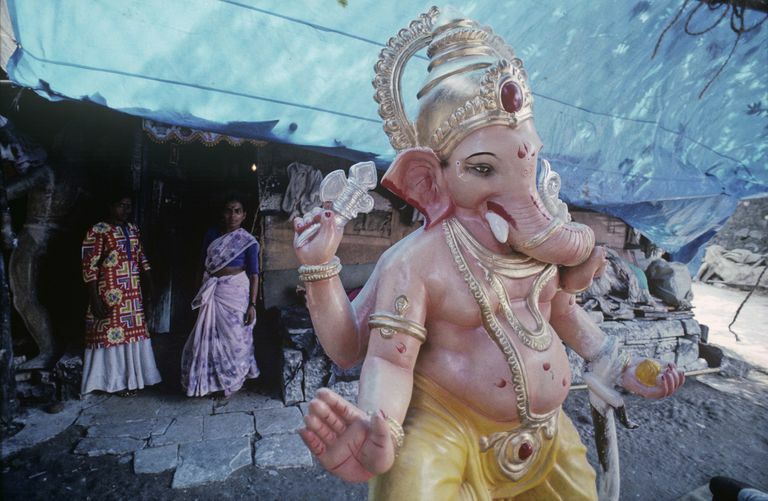 What Are the Lyrics to Aarti, the Hymn Celebrating Lord Ganesha?